CTRL + M: selects drawing elements. If more than one drawing is available, the mouse arrow has to be in the area of the drawing that shall be selected. Pan function: By pressed scroll wheel you can move in a drawing. The CAD user interface contains several components. On the following pages you get more information about the function of these components. horten your mouse movement and speed up your work in CAD with the new custom toolbars. You can select a toolbar from the list on the left under “Select toolbar.” All functions available in the selected toolbar are listed. To create a new toolbar, click on the button with the green plus sign. Enter a name for the toolbar. Now, select the functions that you wish to incorporate in your toolbar from the list on the right side. To do so, set a check mark in front of the function. When you are done compiling your toolbar, click on the “Save” button. 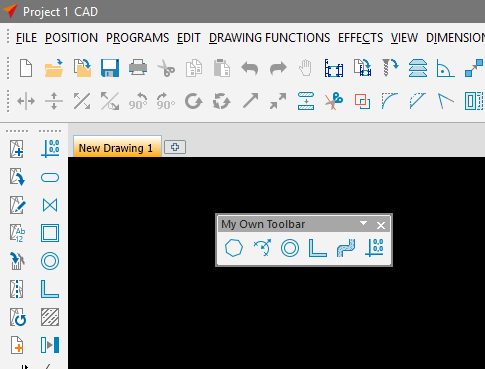 Your toolbar will now appear in CAD, where you can place it in the desired location. Click with pressed left mouse key on the dotted line on the left of the toolbar. You are able to change the position of the toolbar. You may determine which icons shall be displayed in the toolbar. Therefore click on the arrow on the right of the toolbar. A menu appears. Here you are able to activate and deactivate the different icons. The status bar is on the bottom of the screen. Here you find information while you are creating a drawing e.g. the coordinates of the cursor and different drawing functions. 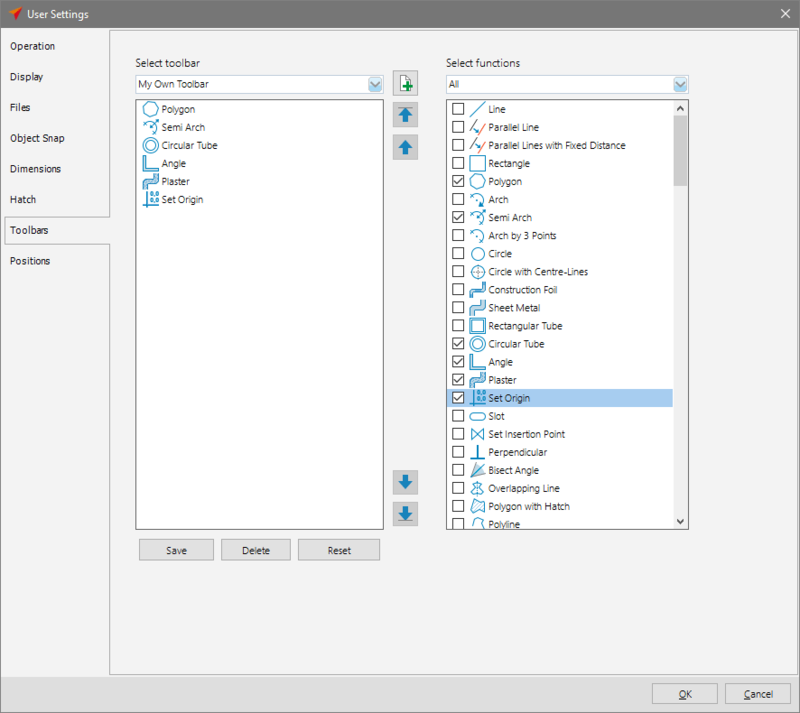 The file menu is on the top of the screen and contains all functions and setting of the LogiKal CAD. Click with the mouse on a item in the file menu, to display the list of the different options. You are also able to use the keyboard. Press the ALT key and the underlined character of the menu item. 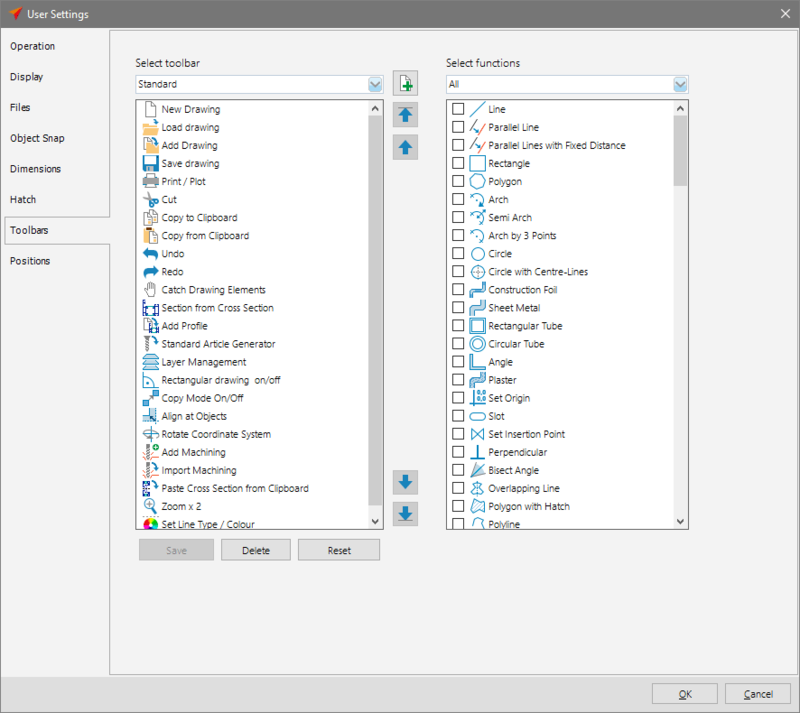 Example: If you want to create a new drawing, press the ALT key and F. The file menu appears. Now press the key N and a blank page appears on the drawing area. By using the context menu you are able to get quick access on all relevant functions while creating a drawing. You may display the context menu by right click in the drawing area. Use the zoom function to enlarge or to reduce the view of drawing. Move the scroll wheel up to zoom in. Move the scroll wheel down zoom out. By using the PAN function you are able to move in a drawing. Therefor press the scroll wheel of the mouse and move it to the desired position. 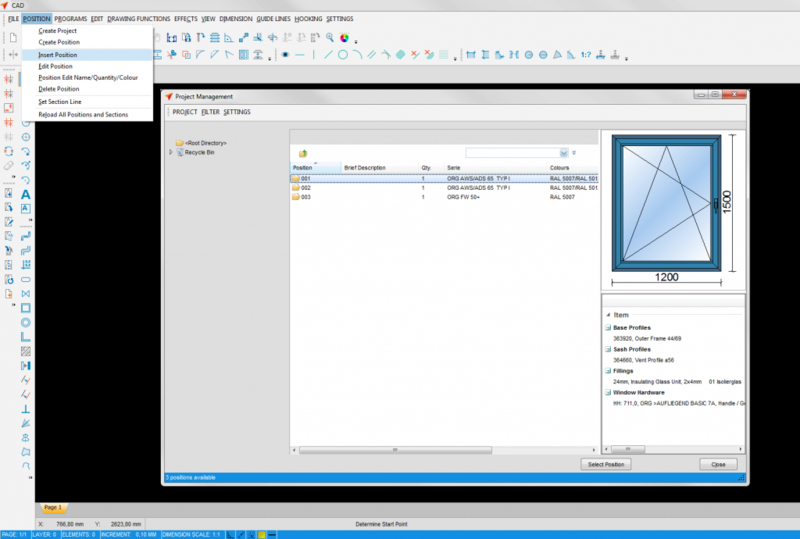 With LogiKal, CAD and estimation are integrated even more tightly. For example, you can incorporate your elements into a CAD installation drawing as early as the design phase. To do so, simply add your item views and sections to your drawing. Modifications made in the Input of Element in LogiKal are immediately updated in the drawing. You can also edit the elements directly from the drawing. This is then updated across all workplaces. This significantly speeds up cooperation at your company and prevents mistakes. All personnel will have access to the same version of the element’s design. This interplay also works when a new CAD system is integrated into your workflow. Here too, modifications are immediately forwarded from CAD to LogiKal and from LogiKal to CAD. In addition, ERP systems use the same connection to keep materials, resource planning, estimations etc. up to date – no matter where or in what linked program the changes are made, all other instances will be current. 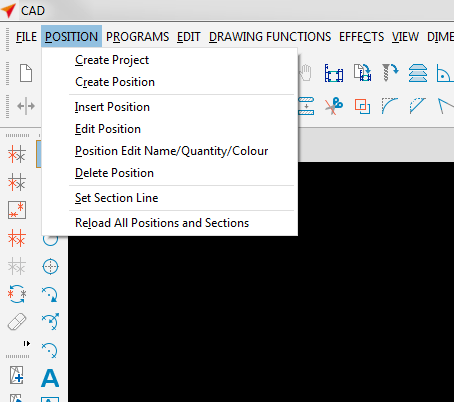 Located in the file menu of CAD is the “Position” menu. This menu allows you to create completely new projects and positions directly in CAD. Positions can be added to the drawing area and edited. 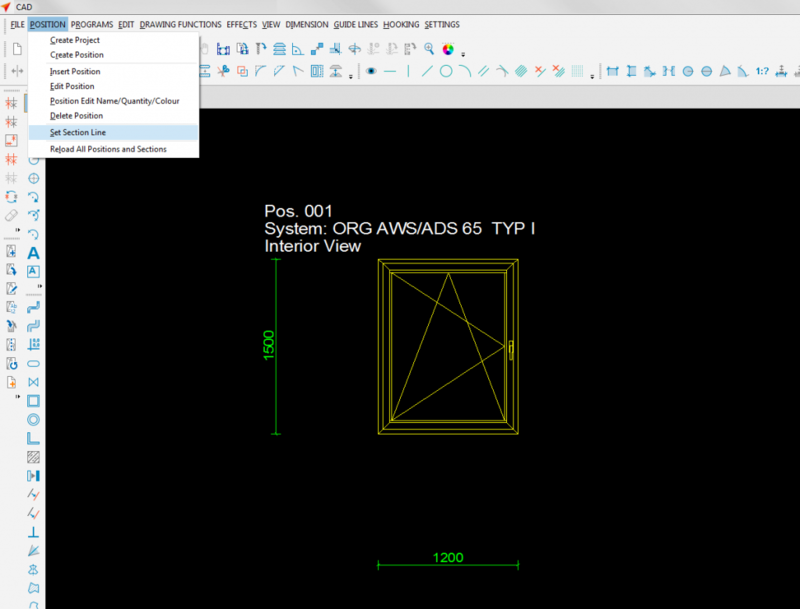 To insert the item, open CAD and click on “Position” -> “Insert Position” in the file menu. Select an item from the list. To generate a cross-sectional view of this position, click on “Position” -> “Set Section Line” in the file menu. Draw the cutting line with the left mouse button pressed. Place the sectional drawing on the drawing area by pressing the left mouse button. The sectional view can be changed by clicking the right mouse button. Dimensional changes can be made directly via “Settings” -> “User Settings” -> “Positions”. This allows you to modify the size ratio between the drawing elements using the scale settings for view and editing. Simplify the handling in CAD and draw even faster by directly accessing the most recently selected function with just a single mouse click. 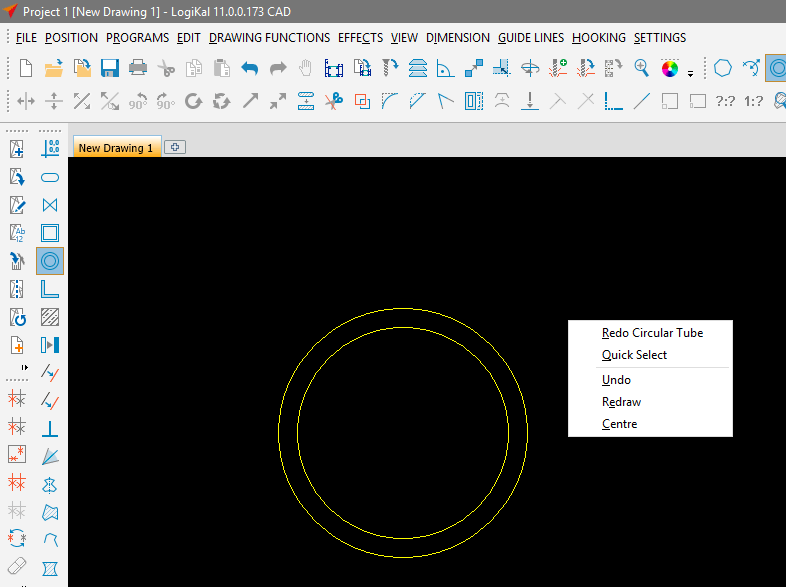 In CAD, open the most recently accessed function by clicking the right mouse button: it is always listed at the very top of the context menu.